Impress the whole crowd with our Garlic, Spinach & Cheddar Fondue! 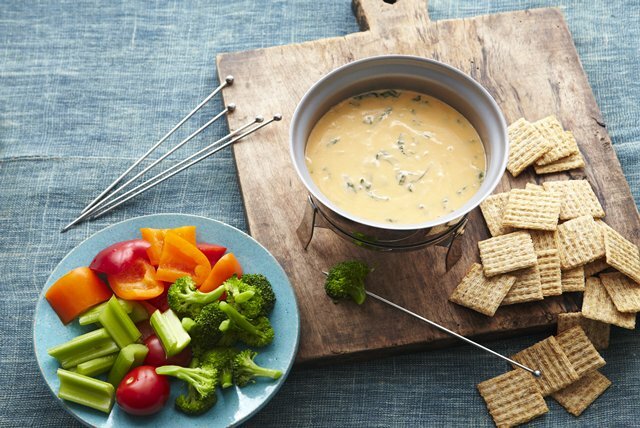 Our Garlic, Spinach & Cheddar Fondue will be a hit at the next party or potluck. Melt butter in medium saucepan on medium heat. Add garlic; cook 2 min., stirring frequently. Stir in wine; bring just to a simmer. Toss shredded cheese with cornstarch. Add, 1/2 cup at a time, to wine mixture; cook 1 min. after each addition or until cheese is completely melted, stirring constantly. Stir in cream cheese spread; cook and stir 2 min. or until melted. Add spinach; cook 2 min. or just until wilted, stirring constantly. Serve in a fondue pot or small slow cooker. Serve with woven wheat crackers and cut-up fresh vegetables. Substitute fat-free reduced-sodium chicken broth or dry vermouth for the wine. Cool any leftovers. Refrigerate up to 3 days. Reheat in saucepan on low heat or in microwave just until heated through, stirring frequently.